As the October 2017 General and Presidential Elections draw close, many questions continue to linger in quarters of local Liberian communities as to the measures put in place to maintain the security of the electoral process and the state. 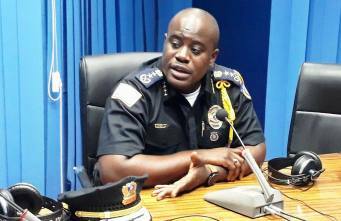 In an attempt to address this issue and others related, the Liberia National Police Inspector General (IG) Commissioner Gregory Coleman who also chairs the Elections Security Taskforce took to the airways to directly engage the public in an attempt to address their concerns. The Project Planning and Management Unit (PPMU) of the Ministry of Justice in partnership with UNMIL recently arranged the appearance of the IG on UNMIL Radio in commemoration of the 30th June 2016 UNMIL turnover of security responsibilities to the Government of Liberia. Coleman called on the public not to panic and disclosed that an elaborate plan for elections security has been developed in concert with other national security apparatus including the Liberia Immigration Service (LIS), the Drug Enforcement Agency (DEA), the Ministry of National Defense, the Liberia National Fire Service (LNFS), the National Security Council (NSC) and the National Elections Commission (NEC) to handle future elections security matters. The plan conforms to standard operations procedure (SOP), respects civil engagement and employs tactical approaches to preventing and responding to elections violence, and protect candidates, ballot materials, public facilities, and the ordinary citizens. After testing and evaluating these approaches, the security sector is upbeat about executing its mandate, but with reliance on citizens’ cooperation and full support to the work of the security and the peace process of Liberia during the polls. More to that, the LNP has reviewed its involvement with a series of elections conducted in Liberia over the years and in the sub region, and lessons learned will be put into practice in October. According to Commissioner Coleman, he is confident that the electoral process will go ahead smoothly, judging from the commitment demonstrated by Liberians at his recent nationwide tour, aimed at getting grassroots opinion on security/civilian relations while meeting citizens and the leadership of political parties and aspirants. Issues of police misconduct, and respect for the police were brought to the table during the deliberation, but melted down on mutual respect by and for both sides of the coin. Complaints coming from the public will be treated with the highest degree of confidentiality and professionalism, something the IG considered as one that would help encourage confidence building in the LNP and checkmate their operations. “This is why the Civilian Complaint Review Board, with majority civilian representation, was setup under the new Police Act of 2016 to look into civilian/police disagreements. We continue to discipline officers for misconduct after members of the public complained, and results of these investigations are published on our website. We encourage the public to further test our resolve and commitment to serving and protecting. On the other hand, the new LNP will not condone any form of disrespect. This is why junior officers in the field have been instructed to never take instructions that have the tendency of compromising their decision, integrity or professionalism that are backed by law from senior officers”, the IG maintained. A Safe City Project, sponsored by the Liberia Telecommunications Cooperation (LIBTELCO) aimed at monitoring the operations, via camera, of officers and incidents in the streets, controlled and monitored at a command post at the LNP Headquarters will boost the output of the LNP. Inadequate mobility, incentives and budget remain major impediments to the functions of the LNP, which the Government and partners are working to address, amidst the enthusiasm of service orientated operations. Recently, a consignment of light vehicles arrived in the country as gift from the people and Government of the US to the LNP. The remaining consignment is expected to arrive soon to enhance adequate mobility of the force during and after the elections. Capacity building, security coordination and adherence to the police standard operations procedures (SOP) have been the pivots at which we draw commitment to serving the Liberian people better. This is why the UN Police has offered to conduct a series of drills and refresher tactical trainings for the LNP to adequately prepare the men for the coming elections. Riot control, dialogue and negotiation, incident and crime investigations and reporting are part of the skills being passed on to the officers at the National Police Training Academy (LNPTA) in Paynesville and at other places of mentoring; UNMIL Headquarters the latest. On close protection for politicians, the Police Commissioner said three officers will be assigned to protect a candidate and further serve as liaison between the police and politicians incase of an incident that requires urgent intervention by the LNP. He clarified that the assigned officers will remain under the command and control of the LNP’s management and not the politician to sustain the loyalty of the officers to the state and not the political candidates or parties. UNMIL turned over security responsibilities to the Liberian Government on 30th June 2016, with the LNP taking a big chunk of those responsibilities in which protection of civilians is paramount. These responsibilities or eight critical tasks are VIP protection, prison security, border management and patrol, static guard and advisory services. Cash escorts, explosive ordinance disposal, human security and the management and monitoring the importation and use of fire arms have been handled well by the national security force with no major incident reported.